Unwind and listen to all of your favourite 50s hits with this Rock & Roll music compilation CD album from Intempo. 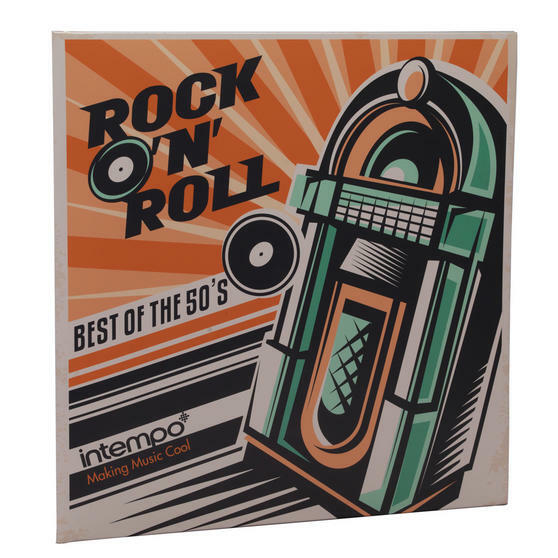 With an incredible selection of the best songs from the decade, including original recordings by Elvis Presley, Roy Orbison, Buddy Holly and Chuck Berry, this album is perfect for any music fan. Brilliantly remastered so you can enjoy a truly authentic audio experience, this album is the ideal gift for any occasion so your friends can enjoy 20 tracks with the best quality sound. For original recordings of classic 50s songs, just add this Rock & Roll album by Intempo to your CD collection. Expertly remastered for CD with outstanding sound quality, you can enjoy listening to legendary tracks at home or in your car. With 20 timeless tracks, the CD will make a wonderful gift to introduce someone you know to Rock & Roll or expand their collection. This CD comes in a case which will protect it from scratches and displays all the tracks so you can skip to your favourite.